I have been backpacking for five years mostly on long weekends in Southern California with one or two 5-day trips per year in the Sierras. My total daypack weight is usually 15 lb (7 kg) and my total backpack weight is usually 28-30 lb (13-14 kg). I am a tent camper and have experienced all night rain, heavy winds, camping in snow once, but mostly fair weather. 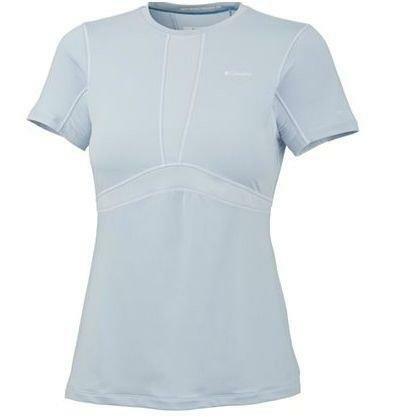 This short sleeve baselayer shirt is meant to be worn on hot hiking days. 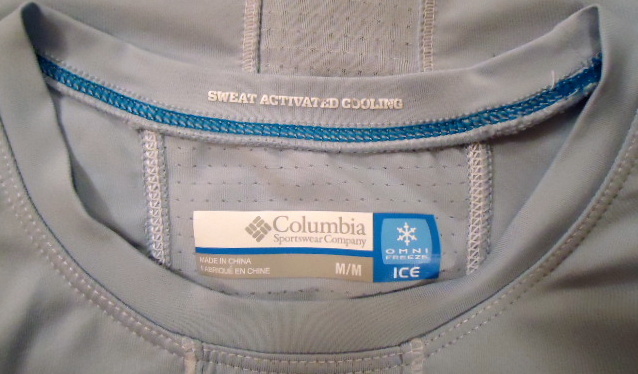 The OmniFreeze Ice designation refers to the sweat activated cooling technology that reportedly keeps the material cool to the touch during hot hiking days. The material feels lightweight, soft and silky. 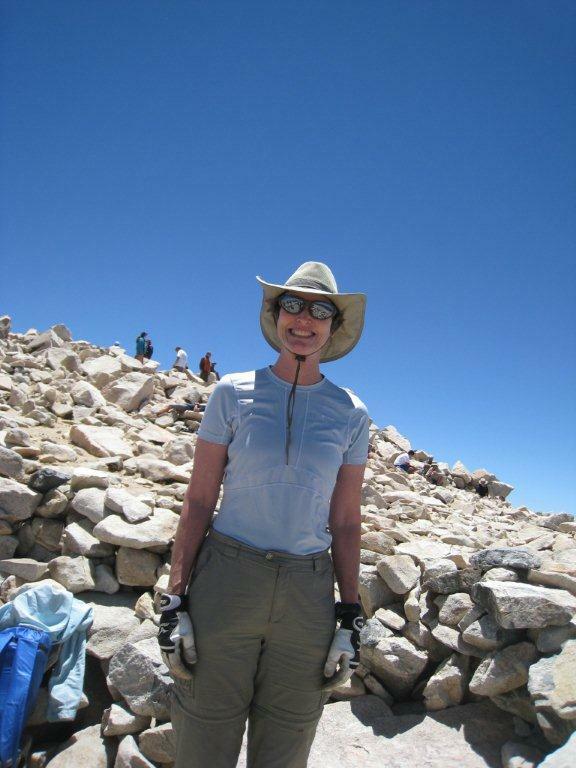 The top fits comfortably as a base layer under a long sleeve hiking shirt. The top has a women's-specific athletic cut and runs long in the torso. From the underarm to the bottom measures 16.5 in (42 cm). The top is cut 1 in (2.5 cm) longer in the back which may make it easier to keep tucked in while wearing a pack. I usually wear a medium and this top fits a little tighter than most other tops I have worn. The top has a crew neckline which is something I like to shade the sun from my chest while hiking. I usually wear a bandana around my neck for this purpose but it may not be necessary while wearing this top. The 4-way stretch moves comfortably, does not bind and returns to its original shape. The sleeves fit tight and are a little shorter than most other tops I have worn. The seams over the shoulders and around the arms are in the traditional t-shirt style which may chafe while wearing a pack. The flatlock stitching may eliminate this issue. The flatlock stitching is the same color as the material used to construct the top. The breathable mesh panels are located under the arms, down the middle of the back, in the middle of the bodice and along the bottom of the bra line in the front. 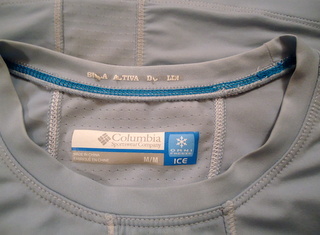 The tags indicate the same color mesh panels are a textured material to assist with ventilation and moisture wicking. According to the manufacturer, the material is antimicrobial to inhibit bacteria growth and control odor. The packaging is eye catching and made me curious about the contents. The tags that came with the top repeat all of the information found on the outside of the package. The top has a tag-less design with the information screenprinted inside. The stitching on the inside of the collar is teal which matches the color on the inside collar tag. 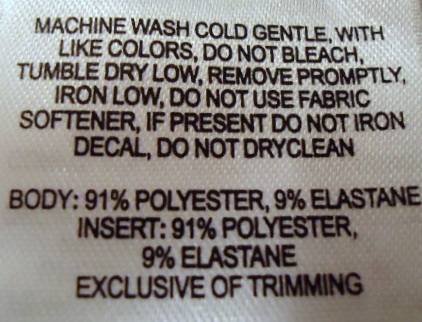 The tag sewn to the inside side seam indicates the top should be machine washed in cold water on the gentle cycle with like colors, tumble dry low and do not bleach or iron. Usually I hang my hiking clothes to dry to prevent unnecessary wear and shrinking. I plan to do the same with this top to make it last longer. I can hardly wait to get out on the trail wearing this top. I plan to wear it every day on my upcoming trips to test its breathability, ventilation, mesh panels, durability, odor control and the 4-way stretch fabric. I wore this shirt every day on all of my trips for a total of 12 days with daytime temperatures averaging 70 F (21 C). 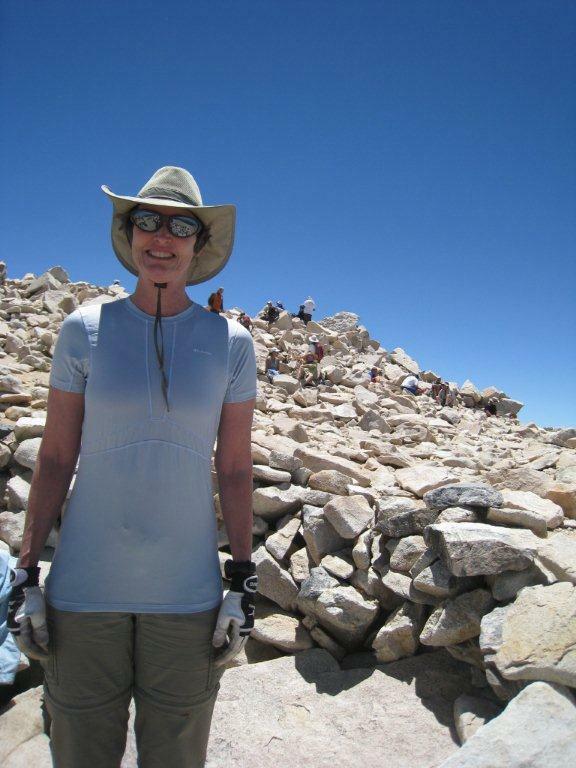 I wore this top as a base layer under a long sleeve hiking shirt that I kept unbuttoned on all of my backpacking trips. The long sleeve shirt was removed during the warmer parts of the day. I noticed and enjoyed the cool feel of this top. Finding this hard to believe, I felt the shirts my friends were wearing for comparison. This top was cooler to the touch than the hiking shirts my friends were wearing. While some dampness occurred due to perspiration, it was limited to that part of my back that was in contact with my pack. The dampness quickly evaporated during short breaks. The breathability of the mesh panels kept me more cool and comfortable than I recall feeling while wearing my other hiking tops. I wore the top tucked into my hiking pants and not tucked in to see how it would perform. I was pleasantly surprised to find the slightly longer back panel stayed tucked into my hiking pants while carrying a fully loaded backpack all day. Because of the longer torso length of the top, I was concerned the top would bunch up if worn outside my hiking pants. I was pleasantly surprised to find the extra material laid comfortably on the outside of my hiking pants when not tucked in. Both tucking options kept me fully covered while wearing my pack and the inevitable bending over and arm stretching to put the pack on and off. The top did not ride up my back in either configuration. I appreciate this feature which I don't usually enjoy with my other hiking shirts. 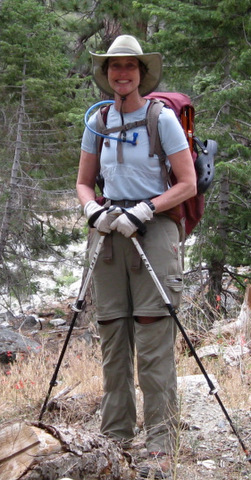 I prefer to wear the top tucked into my hiking pants, but either way is very comfortable. I did not wash the top during my trips because I wanted to test the odor control feature. When putting on the top in the morning, I did not notice an odor. This is a great feature and allows me to leave my extra tops at home. I appreciate any item that saves weight and space in my pack. The top is comfortably stretchy and hugs my body in all the right places. The sleeves are a little shorter than my other tops, but they worked well under the long sleeve hiking shirt. The top retains its shape after many days of wear. There is no wear at any of the pack contact points or at any other location on the top. I have washed the top after every trip and after my day hikes and conditioning hikes which I estimate to be at least ten times. I washed the top on the gentle cycle using a small amount of detergent and then hung it to dry. The top dries quickly and is ready for my next adventure. The crew neckline worked well to shade my neck and chest from the sun while hiking. There is no chafing at the seams near the flatlock stitching. I haven't noticed any wear or loose threads near the seams. The top looks and feels like the first day I wore it. If I hadn't worn it myself, I would think it was brand new. The top keeps me cool, dry and comfortable all day whether carrying a fully loaded backpack or a daypack for a peak-bagging day hike. The top stays tucked in if I select that option. It does not take on the odor of the outdoors which I appreciate. So far, there has been no stretching, bunching or pilling of the materials used to construct the top. I wore the shirt as a base layer under a heavier thermal shirt on the 6-day trip without laundering to test the odor control feature. I warned my hiking partners of my plan and asked them to please let me know if laundering was necessary. I did not wear the shirt at night. While the temps were cool, I noticed some perspiration on some of the steeper sections of trail when the sun peeked out from behind the clouds during day hikes. By the end of the trip, this shirt had a mild odor, but nothing compared to the other clothing items worn every day of the trip. This made me think I may need to get more of these shirts. Finding this a little unbelievable, I asked my hiking partners to test my findings by smelling the shirt up close. They agreed that this shirt compared favorably to other items of clothing worn for the entire trip. This shirt continued to perform well during the Long-Term Report period of this test. The shirt still looks mostly like new, repels stains, does not retain odor and does not wrinkle. The shirt is still just as comfortable as the first time I put it on. I enjoy the option to tuck in the shirt or not, depending on the situation. The shirt was comfortable to wear as a base layer or by itself in all temperatures tested. The only wear I noticed was the lettering on the inside back of the collar is wearing off, but this does not affect the performance of the shirt. This is one awesome shirt. I wish it was available in a long sleeve version to protect my arms from the sun on those hot hiking days. The 4-way stretch allows the shirt to move with me and does not bind. The flatlock stitching on the seams over the shoulders and around the arms show no wear and did not chafe while wearing a pack. The breathable panels continue to wick moisture while hiking. Perspiration does occur in the area underneath the pack, but once the pack is removed, that area of the shirt is dry within a few minutes. I will continue to use the shirt as a base layer or by itself depending on the weather on all of my trips in the future. This concludes this test series. Thank you to Columbia Sportswear Company and BackpackGearTest.org for the opportunity to test this shirt.